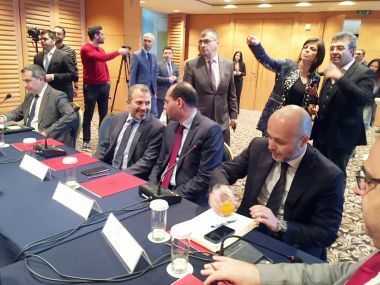 "The significant role they shall play in boosting Lebanon's foreign trade"
Lebanon - Foreign Minister Gebran Bassil on Friday chaired a workshop to discuss means of enhancing economic and trade relations between Lebanon and the Lebanese emigrants across the world, held at the Royal Hotel in Dbayeh. The workshop was attended by newly appointed Minister of Economy and Trade, Mansour Bteish, and Minister of State for Foreign Trade Affairs Hassan Murad, in addition to the new economic attachés appointed by the Ministry of Foreign Affairs for the first time. Addressing the newly appointed economic attachés, Bassil the significant role they shall play in boosting Lebanon's foreign trade.